"This is bigger than just performing. We are showing the world hope." 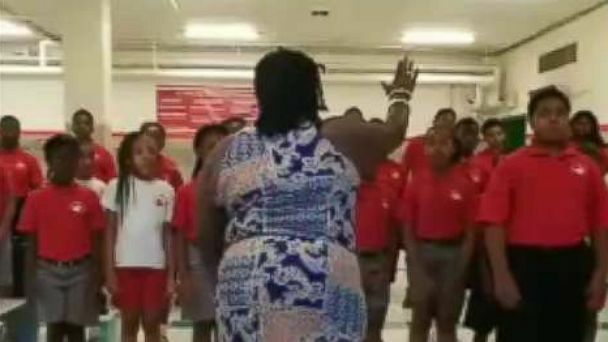 When middle-school choir director Kenyatta Hardison posted a live Facebook video, she never expected that a video meant to showcase her students’ passion and progress would eventually rack up more than 16 million views, resonating with people like a soldier serving abroad, a victim of a natural disaster and even a cancer survivor. “Not perfect but Imperfectly perfect,” she wrote late last month, sharing the rehearsal with the parents and friends of Cardinal Shehan School in Baltimore. But in a time when “viral” usually means a cute cat doing something silly for less than 60 seconds, something struck a chord with those who watched the nearly nine-minute video. Family and friends of the Baltimore community shared the video with their friends and families across the United States, who in turn shared it with others, eventually going viral. "There was a lady who was getting ready to get her chemo treatment, and she said when she played that song, it just touched her heart and it gave her hope," Hardison, 44, told ABC News. "And so I told my kids, ‘This is a different type of move here. This is a mighty move and we have a big responsibility to share hope,’" she added. (Kenyatta Hardison/Cardinal Shehan School Choir) Students practice their solos during a choir rehearsal at the Cardinal Shehan School in Baltimore, Md. The viral video, which has been shared more than 16 million times, has drawn praise from around the world for the students' passionate rendition of artist Andra Day's "Rise Up." The choir in the video is singing Andra Day’s "Rise Up," a song whose lyrics focus on hope, love, bringing the world to its feet and, ultimately, moving mountains. The lyrics touched something deep inside not only those who listened to it but also the children themselves. "God has blessed us with gifts that he wanted us to have, and I've said this a bazillion times and I'm going to say it again: We have a purpose here," John Paige, an 11-year-old soloist seen in the video, said. 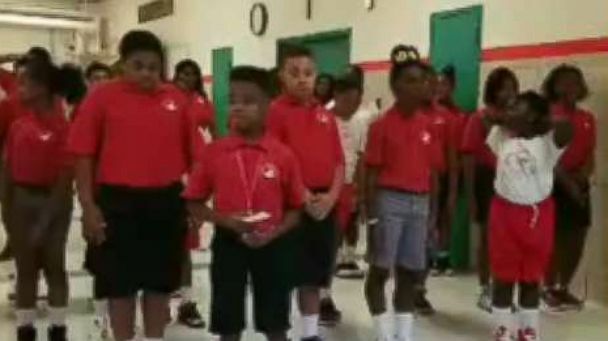 "You have a purpose in life, and our purpose, I think, is to make people happy when we sing songs,” the sixth-grader said, adding that he hopes their song shows young people in troubled communities that they can have futures without murder, drugs or jail time. "There’s a big problem that they’re always thinking, 'Oh, I can’t do this' or 'Oh, I’m not going to make it. I should just drop out of school.' Just put the gun down. Throw those drugs away. You don't need this. You know that this isn't good for you,” John said. For sixth-grader Kai Young, the song hits a more personal note. Young, who has wanted to sing since the age of 3, said he prays his song brings hope to his grandmother. "She’s 90 now and I’m scared for her because I’m worried that I might lose her," Kai said, covering his eyes before wiping a tear from his face. "I think she’s thinking, 'Go Kai. That’s my boy,'" Kai, 11, whispered softly. (Kenyatta Hardison/Cardinal Shehan School Choir) Choir Director Kenyatta Hardison leads her students through a choir rehearsal at the Cardinal Shehan School in Baltimore Md. The viral video, which has been shared more than 16 million times, has drawn praise from around the world for the students' passionate rendition of artist Andra Day's "Rise Up." The video, which has seen an outpouring of support online, also brought its own community together. One man came and donated $100 to the school after showing the video to his bedridden father in the hospital, who smiled upon seeing it, choir director Hardison said. The man said he needed to thank Hardison’s choir for lifting his father’s spirits, she said. "I said to my kids, 'Wow. God is using you. This is bigger than just performing. We are showing the world hope.' And I say, "Are you all ready for this task?' And they say, 'Yes!'" Hardison said. Hardison, a veteran teacher of 23 years and a Baltimore native, recognized that her city doesn’t always have the best reputation. It’s something she hopes to remedy with the popularity of the video. "It's sad when you say Baltimore and [people] think of ‘The Wire’ and they think of death," Hardison said, citing the HBO crime drama television series that many criticized as depicting the worst of Baltimore. "But I’ve been here and I’ve been teaching here, and I've seen talent in and out of this school, around Baltimore. I'm just glad that people are able to see that there are kids here that have compassion,” she said. “They have heart. They have talent. We just need somebody to bring it out."